A few weeks ago I was walking through Barnes & Noble when the book “Wherever You Go?” by Pat Zietlow Miller and Eliza Wheeler caught my eye. I love Eliza Wheeler’s illustrations. I loved that she created worlds and scenes. I was really inspired by her work. 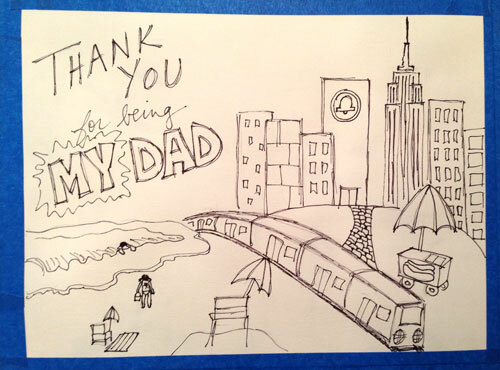 I wanted to try to create my own scene and I decided that a homemade card for Father’s Day was the perfect project. As a parent, I can’t help but think back on my own childhood and some treasured outings with my dad. The yearly trip to his office in Manhattan was a highlight for me – the subway, a street hotdog, his office at the telephone company, etc. I also fondly remember our Saturday morning trips to the beach. My mom was working one summer so it was just the two of us. My dad was the one who taught me to body surf. 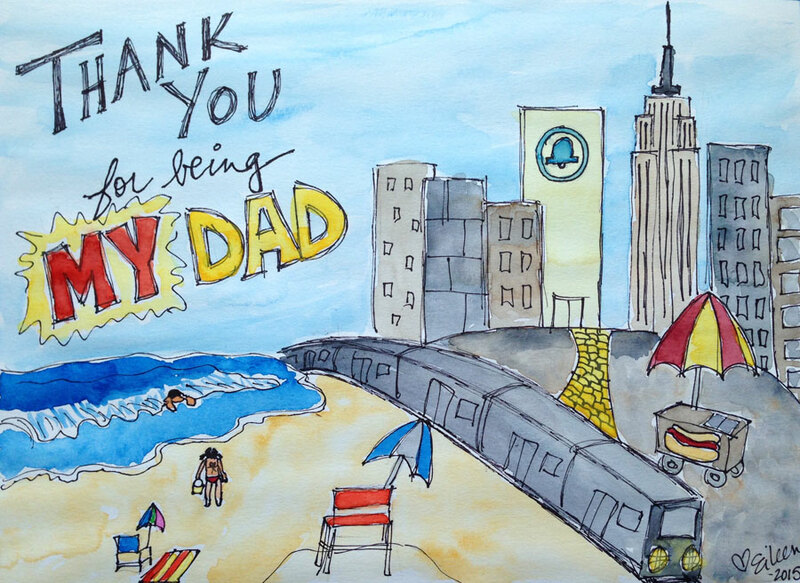 The interesting (and unintentional) thing about my card is it really represents my dad – the city boy who ended up settling by the beach. The little boy who went to sleep with the subway rattling outside his bedroom window, who now goes to sleep to the sound of waves crashing. I am hoping to paint more scenes in the future. Categories: Illustration | Tags: beach, children's book, children's illustration, city, dad, father, illustration, ink, inspiration, NYC, painting, Sketch, watercolor | Permalink. This is completely awesome Eileen! I’m sure your dad treasures it immensely! Best gift ever! It’s wonderful! What Jodi said!